deeelite were retro at a time when retro was not cool. in 1990 we looked to the future not the past and the 70s sound was a stark reminder of the recent past. we laughed at photos of our parents in flares, platforms and afros – deeelite defiantly wore all three and looked cool. we were dumbstruck, and fell in love with their barefaced cheek. their sound and their image complemented each other perfectly. swirly, quirky and full of colour. as 60s babies, the trio had updated the 70s rainbow funk of their childhood and updated it for the new generation. they were so not cool in terms of the new age image of the time that clothed itself in crystals and white chiffon, but their positive vibes complemented the ethos perfectly. grass roots soul – like any of today’s screechy r&b divas on valium and forced to sit in a garden all day. this is the sampladelic relics… version as i’m sure you all have the original by now. early house/bleep with a human edge. i remember the cd single cover looked like a victoria plum pencil pot i had in infant school. actually i still have the pot somewhere – and this guru remix. the second single from their debut album ‘world clique’ and long a bone of contention for me as the single remix is vastly superior to the album version. and yet you can’t find it anywhere – so, this is a ‘pitchy’ as paula abdul would say, youtube rip. from second album ‘infinity within’ this was a clubbier direction. chilled jazz hop with a floral trim. ravey, rumbling track that was a bit darker than anything else on ‘dewdrops’. 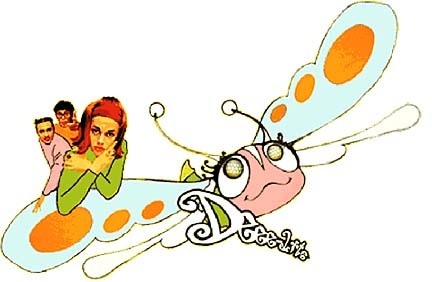 lady miss kier can get down with the best of them…its not all butterflies and eyeliner. bouncy rave track wth breathy vocals. …collective sigh of relief, one blogger isn’t getting into the whole don imus thing. quite frankly, I don’t know enough about it. more interestingly what it does seem to have triggered is renewed interest in the crusade against misogynistic and violent hiphop lyrics, a cause currently championed by russell simmons.i’m not going to delve for examples of russell‘s back catalogue that contradict this stance. it’s not big and it’s not clever – people are perfectly entitled to change their opinions. what i’m not clear on though, is why they think the campaign will work this time round. the number of hiphop devotees has multiplied more than every other genre since the mass media last rallied in the early 90s. then, they targeted just a handful of rappers, including too short, tupac and snoop. because that was more or less the scale of the ‘problem’, a couple of record labels, a lot of overblown egos and scores to settle. in 2007 its a whole different ballgame – they’re not attacking a subsection of underground culture, hiphop is now popular culture. no doubt, the campaign will hold up tupac and biggie‘s deaths, which now happened more than a decade ago, as proof of hiphop beef taken too far. and they were far from an everyday occurrence, the isolation of the incidents involving these tragic figures is exactly what has created their legend. far more people die on the streets every day than have hiphop icons over the last 20 years. and i’m pretty sure most of the street incidents happened to the kind of person who was going to get caught up in that world anyway. listening to eminem in your bedroom does not magically transport you out of the suburbs to the kinds of places where you might face those kind of kill-or-be-killed decisions. perhaps the real shock factor in these deaths was borne out of a naïve assumption that a celebrity can more effectively shield themselves from someone who wants to kill them than the average member of the same community. that they were granted some kind of immunity and had transcended their circumstances through fame, rather than in fact becoming more vulnerable and a greater scalp. what we should remember is that genuine hiphop tries to reflect real life. nwa didn’t just rap about compton to entertain you, that’s where they’re from and who they are. they were trying to give their community a voice, not suggest that their reality is anything like yours and that their actions and reactions would be acceptable within other contexts. in the worst neighbourhoods, shot or be shot is an almost daily dilemma. 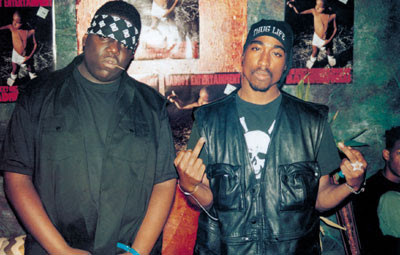 tupac and biggie‘s deaths weren’t the shocking result of fiction overstepping the boundaries of storytelling, rather a sad indictment of a lifestyle they glorified for cash rather than broke out of. there wasn’t any fiction involved and their late material implied an acceptance of their fate. so, those that should know better are regrouping to decide how to remove offensive content from hiphop. instead of convening to tackle the real life incidents that inspire it. then the rest of us can pretend its not happening anymore. great, well done. king of non-offensive hiphop, guru and then-acid jazz ingenue n’dea davenport from the brand new heavies flirt back and forth in 1993.
even g’s get it bad sometimes. now this one could really be messy – common has woken up next to his best friend’s girl. how many men actively try to treat their women right? ll pioneered the hiphop ballad with ‘i need love’, then in 1995 he went one better and recruited r&b crooner boyz ii men to assist this tale of an unobtainable crush. new relationships are hard…especially when you meet in paris and are worried the spark will fade once you get home. best use of a sample ever. end of. these relative newcomers are doing their thing, with ex-dc starlet letoya on board. how come someone as fine as ll never gets his dream girl?